23 June 2015The adventure continues: ESA today confirmed that its Rosetta mission will be extended until the end of September 2016, at which point the spacecraft will most likely be landed on the surface of Comet 67P/Churyumov-Gerasimenko. Rosetta was launched in 2004 and arrived at the comet in August 2014, where it has been studying the nucleus and its environment as the comet moves along its 6.5-year orbit closer to the Sun. 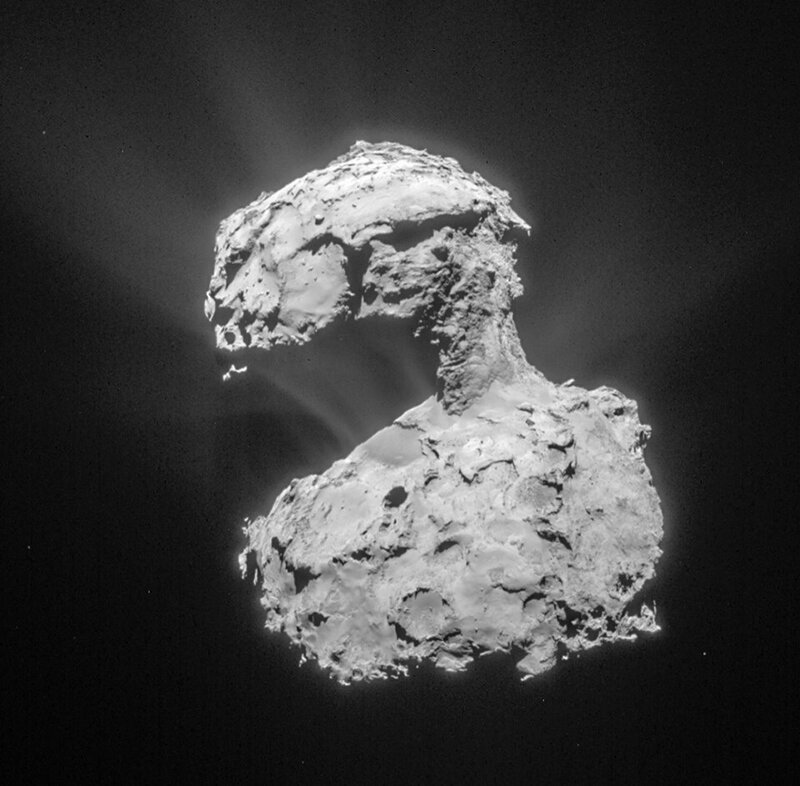 After a detailed survey, Rosetta deployed the lander, Philae, to the surface on 12 November. Philae fell into hibernation after 57 hours of initial scientific operations, but recently awoke and made contact with Rosetta again. Rosetta’s nominal mission was originally funded until the end of December 2015, but at a meeting today, ESA’s Science Programme Committee has given formal approval to continue the mission for an additional nine months. At that point, as the comet moves far away from the Sun again, there will no longer be enough solar power to run Rosetta’s set of scientific instrumentation efficiently. Comet 67P/Churyumov-Gerasimenko will make its closest approach to the Sun on 13 August and Rosetta has been watching its activity increase over the last year. Continuing its study of the comet in the year following perihelion will give scientists a fuller picture of how a comet’s activity waxes and wanes along its orbit. The extra observations collected by Rosetta will also provide additional context for complementary Earth-based observations of the comet. At present, the comet is close to the line-of-sight to the Sun, making ground-based observations difficult. As the activity diminishes post-perihelion, it should be possible to move the orbiter much closer to the comet’s nucleus again, to make a detailed survey of changes in the comet’s properties during its brief ‘summer’. In addition, there may be an opportunity to make a definitive visual identification of Philae. Although candidates have been seen in images acquired from a distance of 20 km, images taken from 10 km or less after perihelion could provide the most compelling confirmation. 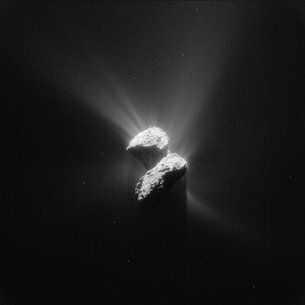 During the extended mission, the team will use the experience gained in operating Rosetta in the challenging cometary environment to carry out some new and potentially slightly riskier investigations, including flights across the night-side of the comet to observe the plasma, dust, and gas interactions in this region, and to collect dust samples ejected close to the nucleus. As the comet recedes from the Sun, the solar-powered spacecraft will no longer receive enough sunlight to operate efficiently and safely, equivalent to the situation in June 2011 when the spacecraft was put into hibernation for 31 months for the most distant leg of its journey out towards the orbit of Jupiter. In addition, Rosetta and the comet will again be close to the Sun as seen from the Earth in October 2016, making operations difficult by then. However, with Rosetta’s propellant largely depleted by that time, it makes little sense to place the spacecraft in hibernation again. “This time, as we’re riding along next to the comet, the most logical way to end the mission is to set Rosetta down on the surface,” says Patrick Martin, Rosetta Mission Manager. Once the orbiter lands on the surface, however, it is highly unlikely to be able to continue operations and relay data back to Earth, bringing to an end one of the most successful space exploration missions of all time. This image, by the Rosetta navigation camera, was taken from a distance of about 53 miles (86 kilometers) from the center of Comet 67P/Churyumov-Gerasimenko on March 14, 2015. The image has a resolution of 24 feet (7 meters) per pixel and is cropped and processed to bring out the details of the comet’s activity. Since last September, scientists using NASA’s Microwave Instrument for Rosetta Orbiter (MIRO) on the European Space Agency’s Rosetta spacecraft have generated maps of the distribution of water in the coma of comet 67P/Churyumov-Gerasimenko, as the comet’s orbit brings it closer to the sun. MIRO is able to detect water in the coma by measuring the direct emission from water vapor in the coma and by observing absorption of radiation from the nucleus at water-specific frequencies as the radiation passed through the coma. What a difference 20 million miles makes! 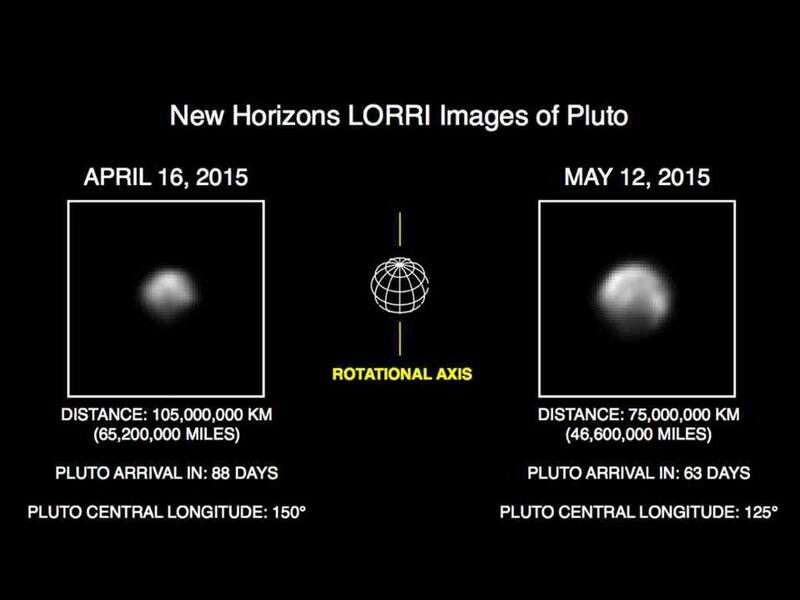 Images of Pluto from NASA’s New Horizons spacecraft are growing in scale as the spacecraft approaches its mysterious target. The new images, taken May 8-12 using a powerful telescopic camera and down-linked last week, reveal more detail about Pluto’s complex and high contrast surface. The comet’s activity has been significantly increasing over the last weeks and months. As the comet moves closer to the Sun along its orbit, its nucleus gets warmer and warmer. Frozen gases sublimate from its surface, carrying dust particles with it and enshrouding the nucleus in a dense coma. With only four months to go until perihelion – the closest point to the Sun – this process is well underway, with pronounced dust jets seen at all times on the comet’s day side. 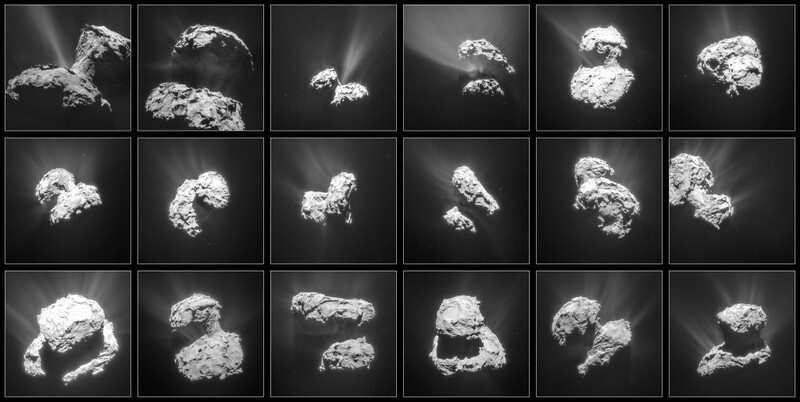 The 13 April 2015 CometWatch entry is dedicated to Comet 67P/C-G’s activity – this stunning montage of images is showcased as our ‘Space Science Image of the Week’. Visit the site below for more information and remarkable images. One of the gorgeous images from Hubble over the past 25 years. 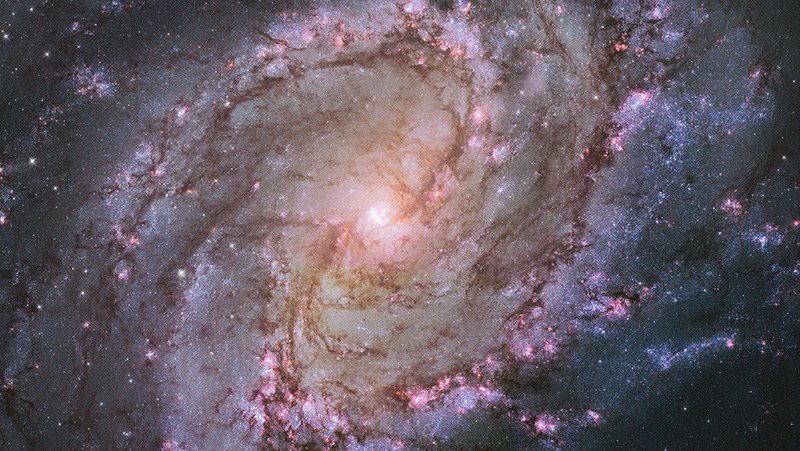 Click on the link to see many more of Hubble’s amazing images. Praying one day as I read an APOD (NASA’s Astronomy Picture of the Day) about black holes, I asked the Lord a question. What are they for? “Trash compactors,” he replied. Hmmm. Here’s an APOD about our own Milky Way and it’s black hole, Sag-A*. At the center of our Milky Way Galaxy, a mere 27,000 light-years away, lies a black hole with 4 million times the mass of the Sun. Fondly known as Sagittarius A* (pronounced A-star), the Milky Way’s black hole is fortunately mild-mannered compared to the central black holes in distant active galaxies, much more calmly consuming material around it. From time to time it does flare-up, though. An outburst lasting several hours is captured in this series of premier X-ray images from the orbiting Nuclear Spectroscopic Telescope Array (NuSTAR). Launched last June 13 (2011), NuSTAR is the first to provide focused views of the area surrounding Sgr A* at X-ray energies higher than those accessible to Chandra and XMM observatories. Spanning two days of NuSTAR observations, the flare sequence is illustrated in the panels at the far right. 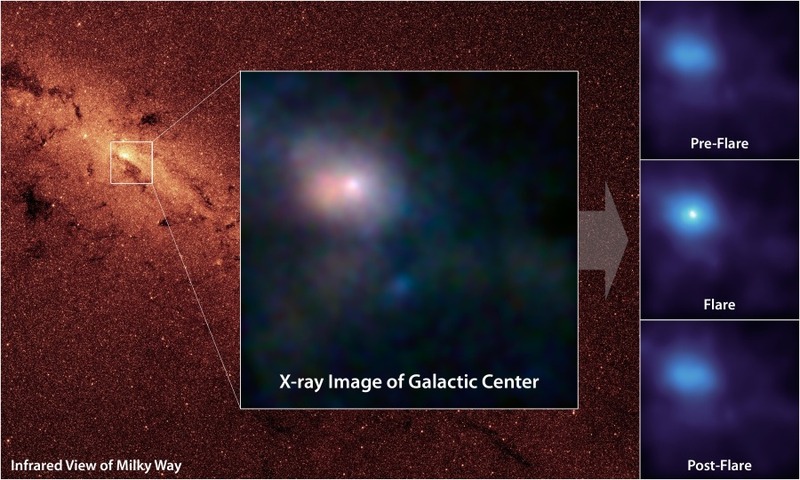 X-rays are generated in material heated to over 100 million degrees Celsius, accelerated to nearly the speed of light as it falls into the Miky Way’s central black hole. The main inset X-ray image spans about 100 light-years. In it, the bright white region represents the hottest material closest to the black hole, while the pinkish cloud likely belongs to a nearby supernova remnant. The 100-kilogram Rosetta lander is provided by a European consortium under the leadership of the German Aerospace Research Institute (DLR). Other members of the consortium are ESA and institutes from Austria, Finland, France, Hungary, Ireland, Italy and the UK. The box-shaped lander is carried on the side of the orbiter until it arrives at Comet 67P/Churyumov-Gerasimenko. Once the orbiter is aligned correctly, the lander is commanded to self-eject from the main spacecraft and unfold its three legs, ready for a gentle touchdown at the end of the ballistic descent. On landing, the legs damp out most of the kinetic energy to reduce the chance of bouncing, and they can rotate, lift or tilt to return the lander to an upright position. Immediately after touchdown, a harpoon is fired to anchor the lander to the ground and prevent it escaping from the comet’s extremely weak gravity. The minimum mission target is one week, but surface operations may continue for many months. The lander structure consists of a baseplate, an instrument platform, and a polygonal sandwich construction, all made of carbon fibre. Some of the instruments and subsystems are beneath a hood that is covered with solar cells. An antenna transmits data from the surface to Earth via the orbiter. The lander carries nine experiments, with a total mass of about 21 kilograms. It also carries a drilling system to take samples of subsurface material. ESA has given the green light for its Rosetta mission to deliver its lander, Philae, to the primary site on 67P/Churyumov–Gerasimenko on 12 November, in the first-ever attempt at a soft touchdown on a comet. Philae’s landing site, currently known as Site J and located on the smaller of the comet’s two ‘lobes’, was confirmed on 14 October following a comprehensive readiness review. Since the arrival, the mission has been conducting an unprecedented survey and scientific analysis of the comet, a remnant of the early phases of the Solar System’s 4.6 billion-year history. At the same time, Rosetta has been moving closer to the comet: starting at 100 km on 6 August, it is now just 10 km from the centre of the 4 km-wide body. This allowed a more detailed look at the primary and backup landing sites in order to complete a hazard assessment, including a detailed boulder census. The decision that the mission is ‘Go’ for Site J also confirms the timeline of events leading up to the landing. Rosetta will release Philae at 08:35 GMT/09:35 CET on 12 November at a distance of approximately 22.5 km from the centre of the comet. Landing will be about seven hours later at around 15:30 GMT/16:30 CET. With a one-way signal travel time between Rosetta and Earth on 12 November of 28 minutes 20 seconds, that means that confirmation of separation will arrive on Earth ground stations at 09:03 GMT/10:03 CET and of touchdown at around 16:00 GMT/17:00 CET. A short manoeuvre must then take place around two hours before separation. This will set Rosetta on course to release Philae on the right trajectory to land on the comet. The final critical Go/No-Go for separation occurs shortly after this manoeuvre. After the release of Philae, Rosetta will manoeuvre up and away from the comet, before reorienting itself in order to establish communications with Philae. All being well, Rosetta and its lander will begin communications about two hours after separation. 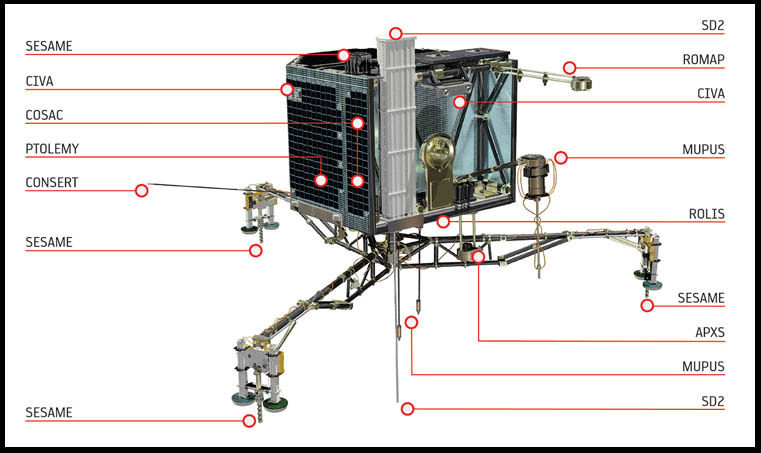 During the seven-hour descent, Philae will take images and conduct science experiments, sampling the dust, gas and plasma environment close to the comet. It will take a ‘farewell’ image of the Rosetta orbiter shortly after separation, along with a number of images as it approaches the comet surface. It is expected that the first images from this sequence will be received on Earth several hours after separation. 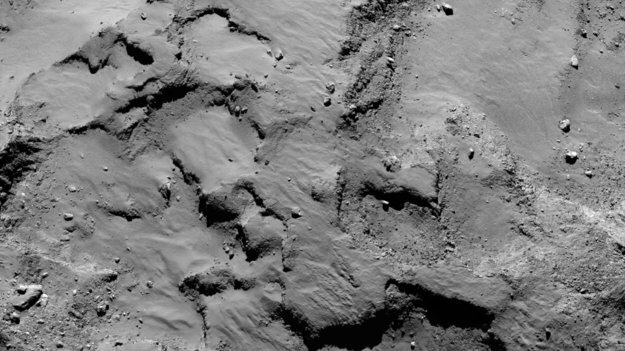 Once safely on the surface, Philae will take a panorama of its surroundings. Again, this is expected back on Earth several hours later. The first sequence of surface science experiments will begin about an hour after touchdown and will last for 64 hours, constrained by the lander’s primary battery lifetime. Longer-term study of the comet by Philae will depend on for how long and how well the batteries are able to recharge, which in turn is related to the amount of dust that settles on its solar panels. 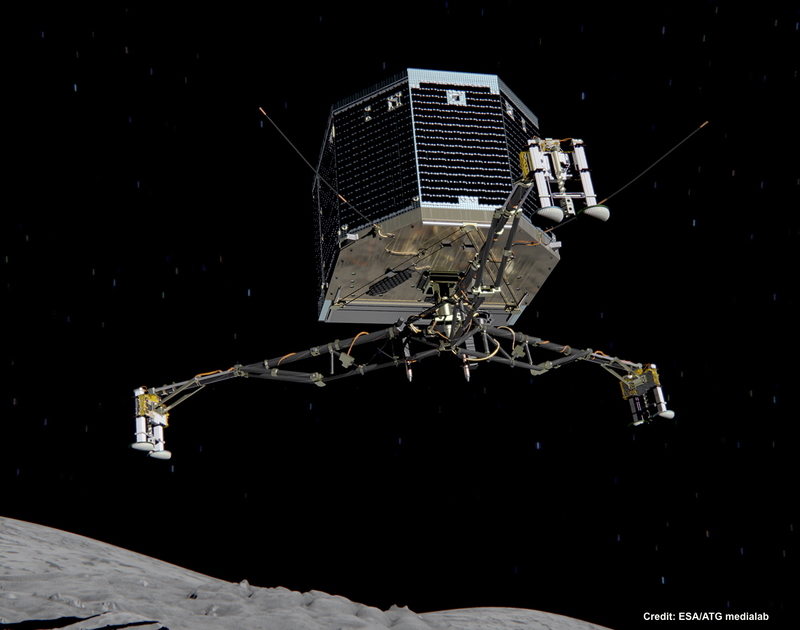 In any case, it is expected that by March 2015, as the comet moves closer in its orbit towards the Sun, temperatures inside the lander will have reached levels too high to continue operations, and Philae’s science mission will come to an end. The Rosetta orbiter’s mission will continue for much longer. It will accompany the comet as it grows in activity until their closest approach to the Sun in August 2015 and then as they head back towards the outer Solar System. This unprecedented mission will study how a comet evolves and give important insights into the formation of our Solar System, and the origins of water and perhaps even life on Earth. 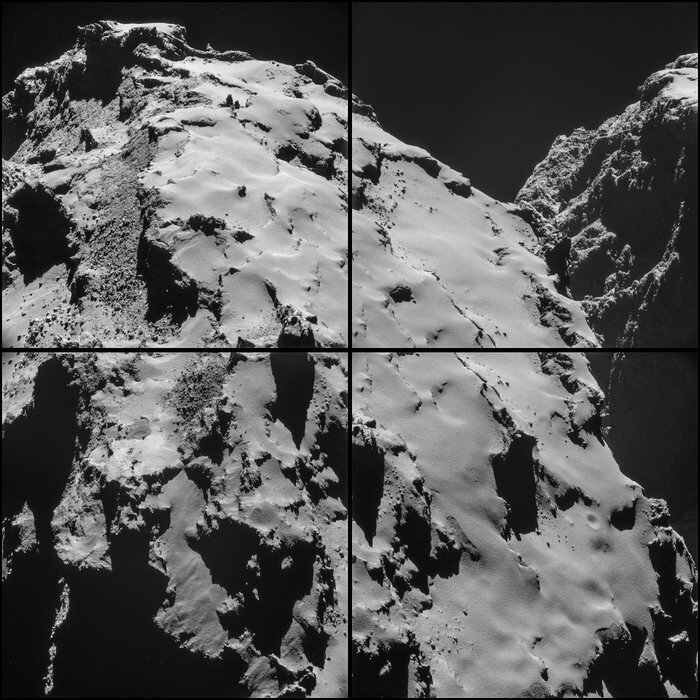 This four-image NAVCAM montage comprises images taken on 28 October – shortly before moving to the pre-lander delivery orbit – from a distance of 9.7 km from the centre of comet 67P/C-G, or roughly 7.7 km from the surface. The corresponding image scale is about 65 cm/pixel, so each 1024 x 1024 pixel frame is about 665 m across. The montage has been slightly tweaked and the central vignetting reduced. The four original frames are provided at the end of the post. The montage nicely ‘joins the dots’ with the region presented in the 8 October montage. 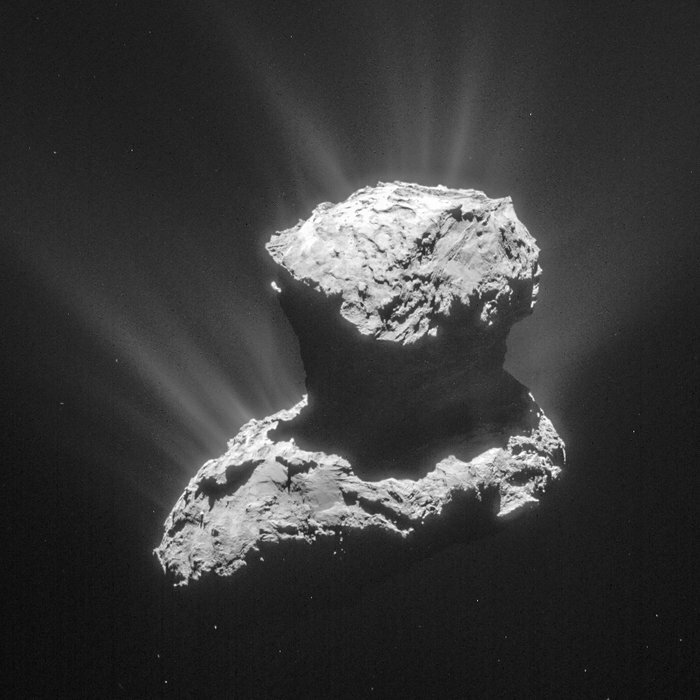 Given the peculiar low-density, low-gravity nature of a comet, it is perhaps dangerous to make direct analogies with Earth-like features and processes. But until we have the science team’s analysis of what they think is actually happening on this comet, analogies might nevertheless still provide a useful way of trying to decipher what we are seeing. In a number of places in this region, there is an impression that the prevalent dusty material covering the surface is not particularly stable and that it occasionally gives way, perhaps in a similar way that snow on a mountain side may become dislodged, giving rise to an avalanche or, alternatively, a rockfall or landslide. For example, look in the lower third of the top left image. There you’ll see what looks like a crack close to the edge of the cliff, suggesting that this portion might eventually collapse, similar to the way a snow cornice on a mountain ridge peels away. This feature is also visible in the 8 October image. Another example can be seen in the lower right corner of the bottom right image, where material appears to have slid over the edge of a cliff. On Earth, avalanches are typically triggered by an increased load, leading to the mechanical failure of a slab of material under gravity, or due to melting snow as a result of increased solar radiation. On a comet, presumably the latter process is more likely to occur, with sublimation-based erosion acting to weaken the surface material, resulting in a collapse. 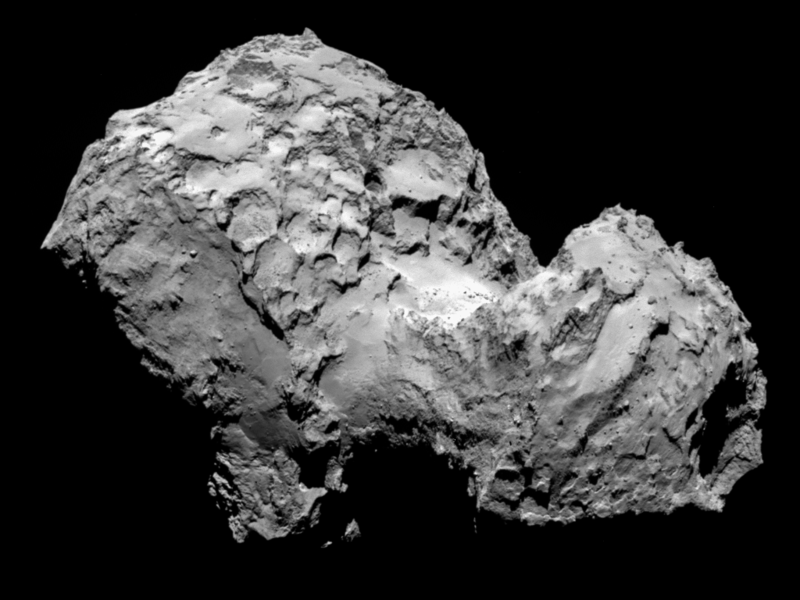 I’ve been following the progress of the ESA Rosetta spacecraft recently as it neared Comet 67P/Churyumov-Gerasimenko. After a ten-year journey, today it arrived! 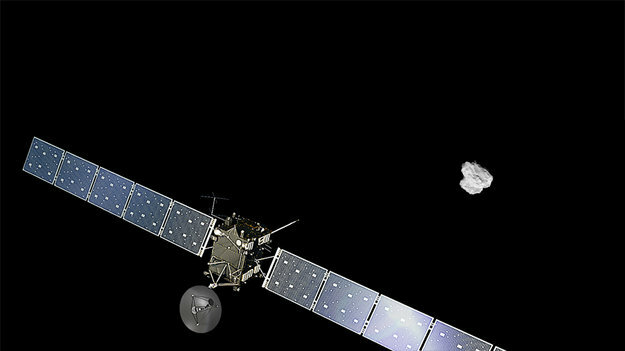 After a decade in space and 4 billion miles, Europe’s Rosetta spacecraft has made history: For the first time ever, a robotic probe from Earth is flying with a comet and will soon enter orbit. The European Space Agency’s Rosetta spacecraft arrived at its target, Comet 67P/Churyumov-Gerasimenko, today (Aug. 6) to end a 10-year journey across the solar system. The spacecraft performed an engine burn that brought it about 62 miles (100 kilometers) from the comet’s surface. Comet 67P/C-G and Rosetta are now flying about 251 million miles (450 million kilometers) from Earth. Engineers on the ground had to program the probe to go through a series of complicated burns and maneuvers to make the spacecraft’s rendezvous with the comet a possibility. “This is the end of 10 years of interplanetary flight,” Rosetta Flight Director Andrea Accomazzo said during ESA’s live comet rendezvous webcast Wednesday. Applause broke out in Rosetta’s mission control center in Darmstadt, Germany, where a crowd of ESA dignitaries and officials had gathered to watch the historic event. “We’re at the comet! Yes!” exclaimed Sylvain Lodiot, Rosetta’s spacecraft operations manager, once the probe’s successful arrival at Comet 67P/C-G was confirmed. 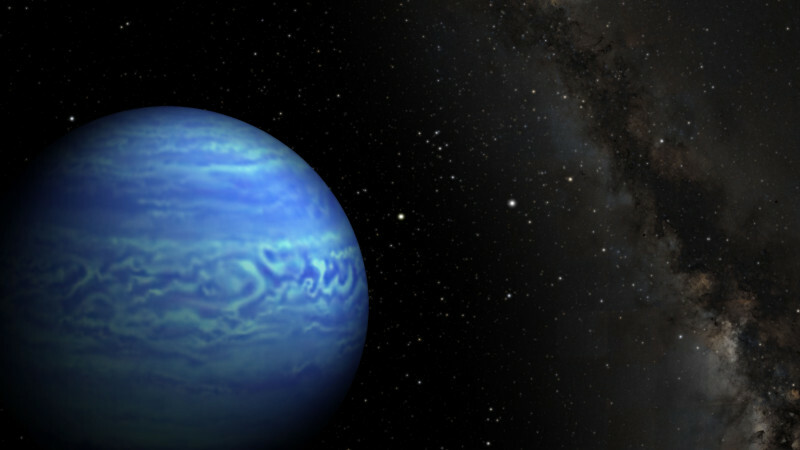 Artist’s conception of the brown dwarf WISE J085510.83-071442.5. The Sun is the bright star directly to the right of the brown dwarf.